Fantasy fiction has produced some of the most unforgettable heroes ever conjured onto the page: Robert E. Howard's Conan the Barbarian, Michael Moorcock's Elric of Melniboné, Fritz Leiber's Fafhrd and the Gray Mouser. Classic characters like these made sword and sorcery a storytelling sensation, a cornerstone of fantasy fiction—and an inspiration for a new generation of writers, spinning their own outsize tales of magic and swashbuckling adventure. 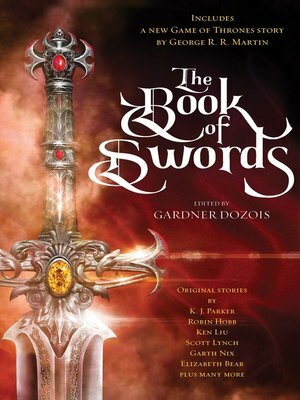 Now, in The Book of Swords, acclaimed editor and bestselling author Gardner Dozois presents an all-new anthology of original epic tales by a stellar cast of award-winning modern masters—many of them set in their authors' best-loved worlds. Join today's finest tellers of fantastic tales, including George R. R. Martin, K. J. Parker, Robin Hobb, Scott Lynch, Ken Liu, C. J. Cherryh, Daniel Abraham, Lavie Tidhar, Ellen Kushner, and more on action-packed journeys into the outer realms of dark enchantment and intrepid derring-do, featuring a stunning assortment of fearless swordsmen and warrior women who face down danger and death at every turn with courage, cunning, and cold steel.